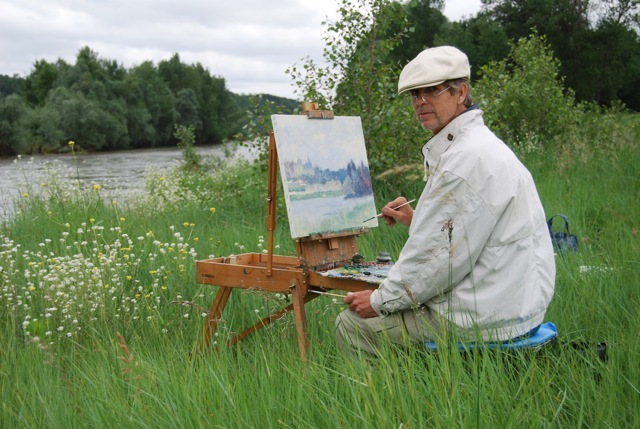 You may remember that I talked about our first guests in Blois – the American Impressionist painter, John Modesitt, and his wife, Toshiko – in a previous post entitled A Painter Comes to Stay. For my monthly guest post on My French Life, I skyped John at his home in San Diego to gain more insight into his love of France and his experience painting in the Loire Valley. Below is an exerpt from the resulting post published on My French Life, the global community of French and francophiles connecting like-minded people in English & French. My love of Impressionist painting goes hand in hand with my love for France. So when I discovered that the first guest at my gîte in the Loire Valley was the well-known American Impressionist John Modesitt, I was thrilled. I was even more delighted when I saw his latest paintings drying on the floor of the kitchen. And I loved and wanted them all! In the end, we chose ‘The Loire at Blois – Noon’ which is now in our living room in Paris. When we retire to Blois in 2014, it will grace the walls of the very house John was staying in when he painted it. Read more. This entry was posted in Art, France, Loire Valley and tagged impressionist painting, impressionists, John Modesitt, MyFrenchLife. Bookmark the permalink.